Travel through the time vortex with the renegade time lord with Doctor Who: The Eternity Clock, burn some rubber with F1 2011 or join a young boy on his crazy adventures with Ben 10 Galactic Racing while you are on-the-go. This handheld gaming console from Sony is an ideal companion for passionate gamers in search of a weapon of impeccable quality and performance, all rolled into one. The combined power of the ARM Cortex-A9 core (4 core) CPU and the SGX543MP4+ GPU gives you graphics akin to the large consoles. With this Sony PS Vita, you carry a complete entertainment solutionin your back pocket. You can listen to your favorite tracks, watch the latest movies, view memorable photographs and surf the World Wide Web with this console. With dimensions of 182.0 x 18.6 x 83.5 mm, this portable console from Sony fits easily your bag or purse. Weighing 260 g, the PS Vita console is light-weight and fits comfortably in the palm of your hands.Ergonomically designed, the Vita makes gaming easy and intuitive. You can enjoy a whole new gaming experience on this eighth generation handheld console. You have the freedom to choose between several interfaces for gaming like a capacitive touchscreen, the rear touch pad, motion control and analog controls. This device has a six-axis motion sensing systems and a three-axis electronic compass. This feature lets you control in-game actions by simply moving the Vita in your hand. The 5 inch OLED touchscreen (16:9) has a resolution of 960 x 544 pixels that effortlessly brings every game to life. This touchscreen can be used for both navigation and gaming action input purposes. The 16 million colors of this console let you enjoy in-game animation and graphics to the fullest. The rear panel of the Sony PS Vita has an ingenious multi touch pad for gaming inputs only. Elegant and sturdy, the PS Vita is real eye-catcher. The analog controller arrangement is familiar and intuitive. The triangle, square, circle and cross action button sit on the right of the gadget, while the D-pad is on the left. You also have the power, home, start, volume and select buttons to make this interface user-friendly. This Sony console also has right and left shoulder pads in place for action inputs whenever necessary. An interesting feature of this handheld console is the analog stick placed on right and left side of the device. The analog sticks let you game with higher precision and pin-point accuracy. To play new games, simply insert a compatible Vita game card into the PlayStation Vita card slot. Alternatively, you can also play games stored on compatible memory cards by inserting it the designated slot. You have a multi-use port which can be used to connect the PS Vita console to other devices via USB, DC IN or even for Stereo Out/Mono In. To enjoy music or movies privately, plug in your earphones into the designated stereo mini headset jack. Furthermore, you are also provided with an accessory port to enhance the overall functionality of this high-performing gaming device. The Sony PlayStation Vita runs on a lithium ion battery pack with a capacity of 2210 mAh that gives you hours of non-stop multimedia fun. You can recharge the battery using the provided 5 V DC adaptor. This handheld console from Sony lets you connect to the Internet via Wi-Fi.You can also connect to several devices via Bluetooth technology. 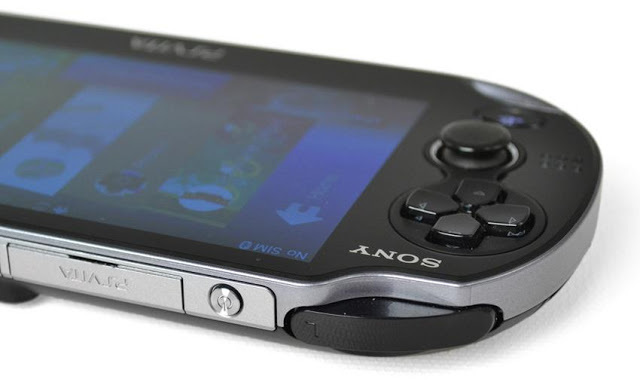 The Sony PS Vita handheld gaming console sports two cameras, one on the front panel and other on the rear. The camera can take images at a resolution of 640 x 480 pixels (VGA). You and your friends can enjoy your favorite playlists or watch a funny TV show as this gaming console is designed with built-in stereo speakers. This Sony console also has a built-in microphone, which comes handy for games that require voice input. With wireless connectivity on your fingertips, you can log onto to the PlayStation Store and access a world of goodies. You can plan online games and keep a track of your scores, even compare it to world’s best gamers. You can also download a fascinating range of games, demos, wallpapers, themes and more. You can further customize and optimize your Vita with apps.